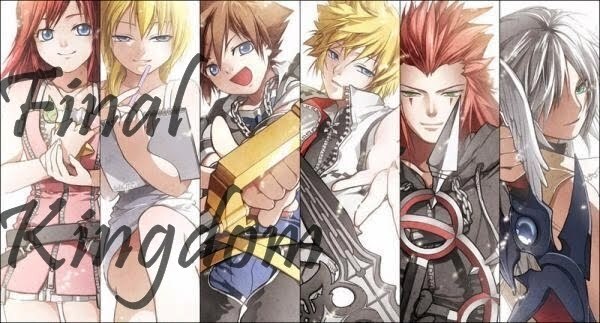 I'm going to post about the game that I think will be one of the best FF games ever... I just hope it is released in english, because otherwise I'll just have to learn japanese in order to play it! The story is the following: there are four realms, called: Suzako Fiefdom of Rubrum, Milites Empire, Lorican Alliance, Kingdom of Concordia. Each has a crystal that gives magic power to the realm and to some people. The Milites Empire's army, under the command of Marshal Cid, invades the other coutries, violating a peace agreement set by the ancient I'cie (I'Cie are something like gods, they have a ative part in FF XIII). He does not conquer the Suzako Peristylium, tough. The army finds a way to nullify the magic of the Rubrum crystal, which powered Suzako, and because of this, the Peristylium falls to Cid's domain. But not everything is lost, since a group of students from the Peristylium Suzako Magic Academy, the Class Zero, still has the power from the crystal, while all other students lose theirs. This group of 12 students, later joined by two more, join the "Operation Apostle", to free the capital of the foreing domain. The battle system in the game is a new evolution of the "ATB Kai" system created by Takatsugu Nakazawa for Final Fantasy X-2, and later refined inCrisis Core -Final Fantasy VII-. 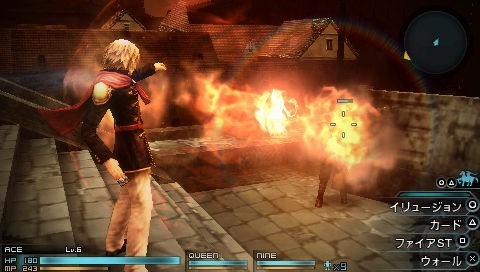 Unlike Crisis Core -Final Fantasy VII-, the combat in Final Fantasy Type-0 is party-based. Instead of navigating through menus, actions are mapped directly to the face buttons for quick access. Nakazawa says he wants it to be the fastest version of ATB ever created. 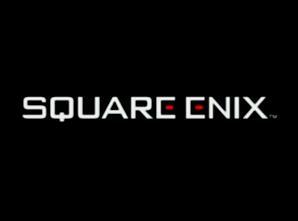 It also supports both Ad-hoc multiplayer for up to three players, and online Square Enix membership connection. This is manifested not in full-scale multiplayer, but as an emergency backup when the player's party is about to be wiped out. Multiplayer will normally last for three minutes, but time can be increased through the gathering of SP. The players can determine the enemies' weak points with Kill Sight, allowing them to deal a deathblow resulting in an Instant Death. There will be some fighting game style elements like movement canceling for skilled action players. Also, like Final Fantasy XIII, the game has a Crystarium system, called Alto Crystarium. This system helps to power up the characters' magic using an energy called "Phantoma", drawn from defeated monsters, to restore or fortify magic. When a character absorbs this energy, their magic recovers a bit. The amount of recovery depends on the type of Phantoma, as indicated by the color. The Phantoma is also used in the Alto Crystarium to power up the characters' magic. Depending on the type of magic, the character can power up their magic in different areas. 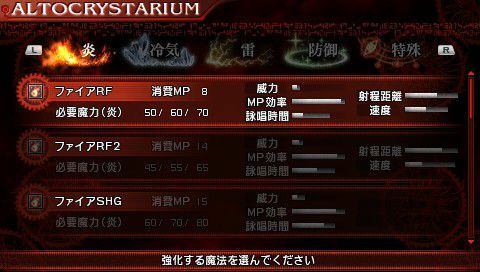 For example, a character's Fire RF magic can be powered up in strength, MP usage, call time, projectile distance and speed. Increasing the Fire RF magic's strength parameter requires six red Phantomas. Shotgun (SHG): This type spreads at multiple height levels. It doesn't travel far, but is powerful against close enemies. Rifle (RF): This type shoots out straight in the direction of the target. It travels far but has narrow range. Bomb (BOM): This type is effective in your immediate surroundings. It can be useful against quick enemies and small enemies. Missile (MIS): This type chases after the enemy before releasing its magic. The higher level (that is, the magic with the "ra" and "ga" at the end of their names) will expand to encompass surroundings. Rocket Launcher (ROK): When you begin casting this type, a target will appear. The magic will fire in the direction that you aim. When it strikes, it will explode and damage enemies in the surroundings. Furthermore, characters and summons can learn their individual abilities by using AP won through leveling. Acquiring new abilities may unveil more advanced abilities that will strengthen each character or summon according to their fighting style. Queen and Nine fighting an enemy leader. Soldiers surrendering after the defeat of their leader. Like Final Fantasy XII, the player has the option to choose the leader of their party of three and party members can be changed during gameplay manually or when the leading member is KOed. 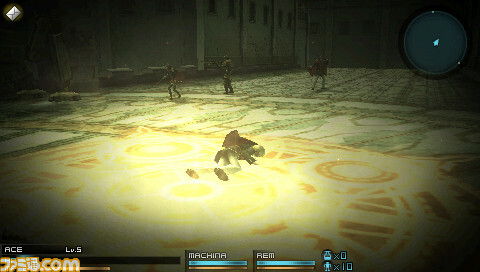 During each mission, the player is able to call in aid from another player (or NPC) for a duration of three minutes, with bonus time granted through good play.In some cases the victory can be decided in other ways, such as defeating the enemy leader, which will trigger the surrender of its minions. Ace is sacrificing himself for summoning. Another feature from the game is the Trinity Attack system. These are group combination skills that require 3 members to pull-off. In general they are much weaker than Summons, but can be used multiple times without needing to sacrifice a character. Speak to moogles for missions. The game's structure is mission-based. There are also sub-objectives in battle to strive for. The game has a World Map, and the player can ride chocobos or fly an airship and use its weapons in an aerial battle. Battles are initiated byRandom Encounters and the monsters roam around the world map. Final Fantasy Type-0's World Map known as the "Active World Map" features two minigame style elements new to the series, War battles called Skirmishes and Airship Dogfights. Skirmishes involves moving troops around and capturing areas in an RTS styled manner. Different troops have different strong points e.g. specialized against machines. Special missions give you encampments to control and more troops to take charge of. In Airship Combat, the airship you control has machine guns installed on it. This means you can take on mounted dragons controlled by Concordia in dog fights. There are various kinds of dragons, including larger ones used by the Royal Guard. You also fight them on the deck. Simulation Battles – The player can progress through 20 rounds of fighting to level up their characters and get them Phantoma. The player still keeps the experience if they die part way through. Secret Training – The Controlled character will be trained while the player's PlayStation Portable is in sleep mode. The more time the PlayStation Portable is in sleep mode, the more EXP the character gets. Tabata also says that Final Fantasy Type-0 is similar to The 3rd Birthday, saying that while they are two different games in terms of content, the core of what the staff can do on the PlayStation Portable in terms of gameplay is similar between the two games. Originally, Class Zero had only twelve students, but later two more joined, Machina Kunagiri and Rem Tokimyia. It's justly because of these additions to the regular 12 students that this class Zero was able to win where all the past others had failed (there were other class Zeros in the past). The end of this game is one of the saddest, even more than KH 358/2 Days. 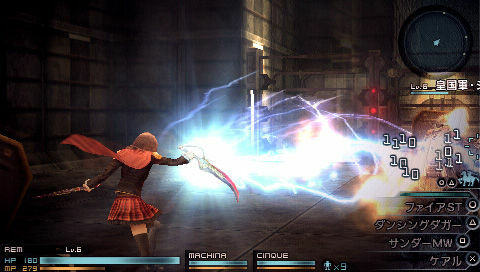 Machina and Rem fight each other without Knowing who they are fighting, and Machina kills her. When he realizes who he just killed, he just gets desperate, and end up freezing to death while holding Rem's body. A I'Cie pities them and revives both. They go back to the academy, just to find out that the whole class died while defeating Cid, just the two of them survived. They write a book preserving the memory of their fallen companions. But there's a alternative ending, when a paralell universe is created, where the whole class is still alive.